If you don't like free stuff you're either really, really, really wealthy or just not big of being given stuff. If you do like free stuff, then you'll love Archie Comics that much more. Right now, the publisher is giving away 100 free digital comics with the chance for fans to unlock 100 more via social media. Right now in the Archie App for iOS, you can snag your free comics. The comics range from some of the earliest Archie Comics stories ever to modern-day crossovers with legendary rock bands and television stars. 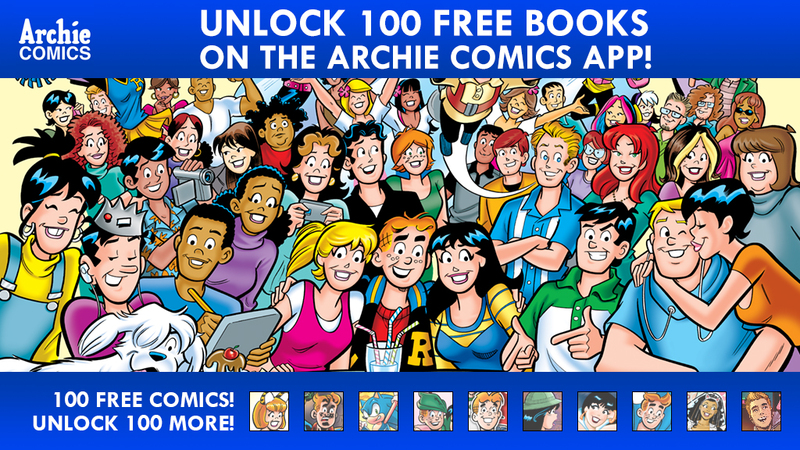 In order to unlock 100 additional digital comics for free, follow @ArchieComics on Twitter and retweet the corresponding tweets with the hashtag #ArchieUnlocks. The publisher will be unlocking bundles of 10 comics at a time once each level hits the retweet goal. 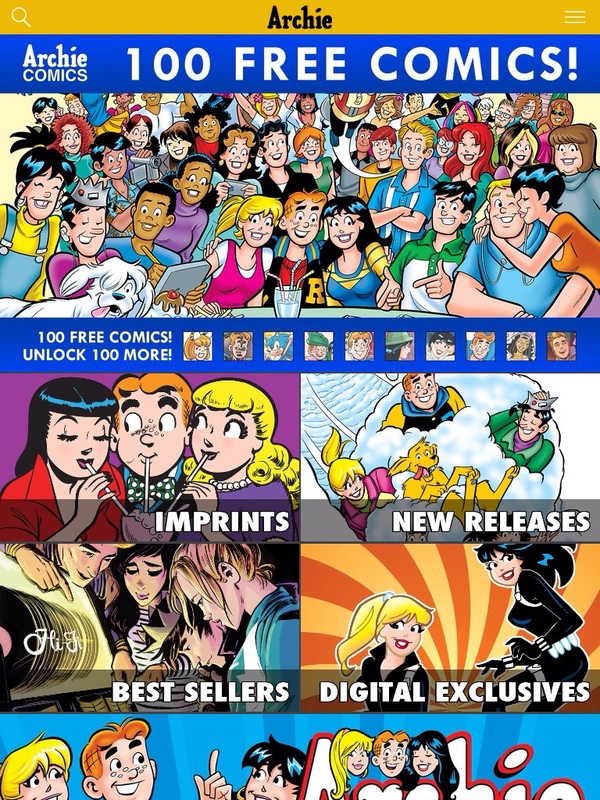 There are ten different bundles of comics including classic Archie storylines, Josie and the Pussycats, Sabrina the Teenage Witch, Sonic the Hedgehog, Mega Man and more. Everyone loves free stuff -- so we're giving away 100 free digital comics with the opportunity for fans to unlock 100 more via social media! Right now on the Archie App for iOS, you can get 100 free comics -- just like that -- as our gift to you! Ranging from some of the earliest Archie Comics stories ever to modern-day crossovers with legendary rock bands and television stars, we're just getting started on this epic giveaway! In order to unlock 100 additional digital comics for free, follow @ArchieComics on Twitter and retweet the corresponding tweets with the hashtag #ArchieUnlocks! We'll be unlocking bundles of 10 comics at a time once we each level hits the retweet goal. There are ten different bundles of comics including classic ARCHIE storylines, JOSIE & THE PUSSYCATS, SABRINA THE TEENAGE WITCH, SONIC THE HEDGEHOG, MEGA MAN, and more! Download the Archie App for iOS, follow Archie Comics on Twitter, and join in on the fun! Don't miss out on this great opportunity to discover new and exciting Archie Comics -- all for free! Download the Archie App for iOS!